Purpose: Many years ago it was not a custom to enter anyones home with long sword as was considered impolite and with intent. However if conflict ensued is is possible to use alonger weapon indoors as one can use a spear. The value of a sword as a thrusting weapon receives little merit nowadays. There are many waza within the ryu that use these methods for example a thrusting cut under the armpit, between the legs or up under the chin into the cranium all produce fatal results. There are also other benefits of a short sword as well as cutting. Before the Meiji era it was also used as throwing weapon. 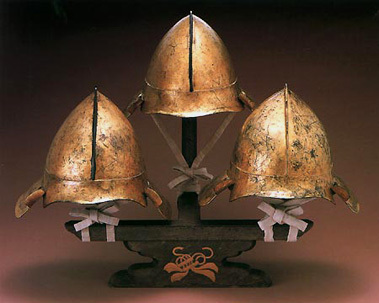 The blade shown above is known as a Makiri. Its use was not only as a weapon but to slice through Japanese doors (fusuma) to gain entry into house. Hence the term as 'ma' can mean door or "devil". In times of peace these methods quickly died out as did foot work required in both inside and outside situations. 2014 Dosokai held in Calgary, Canada. We also have members in U.S.A, Panama and Japan and S.A.E. There is also Facebook Dosokai community. 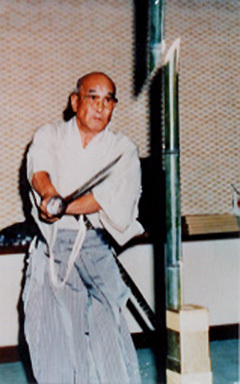 Despite rigorous training in Kageryu exponents are encouraged to study more than just swordsmanship and practice other Japanese traditional arts Yanagawa Kobudo Shinkokai have incuded Shakuhachi, shigin, The mikkyo (esoteric practices)and Jingai (Triton horn) of the Honzan Shugenshu ( a Buddhist Yamabushi sect) Black joba-hakama and uwagi with han-juban are worn for everyday practice. White uwagi in the warmer months. Kaiin are required to wear montsuki-hakama bearing the family crest of the Tachibana clan for formal events. Crest of interwined Ginko Leaves shown below. The Ryu has survived to this day with no rank or gradings. 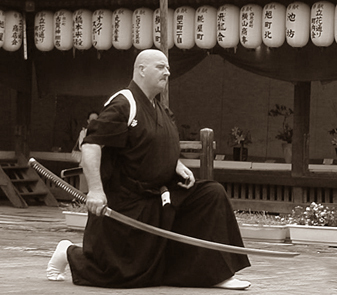 However, holding grades or rank in other forms of martial arts are beneficial if one wishes to become a member. The ryu uses the method of Nukemi. To act first then delay striking after the opponent has commited. This of course is closely related to Musashi's Sen as its takes advantage of the opponents attack. Right: Nathan Morrison a Kageryu uchideshi now studying in Japan performing Goseiken. 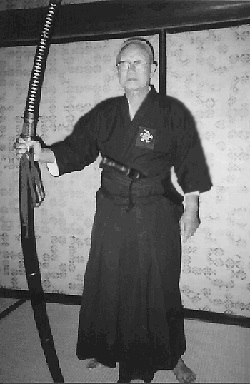 Kyudai Soke of the Taiko Konoha Ryu. 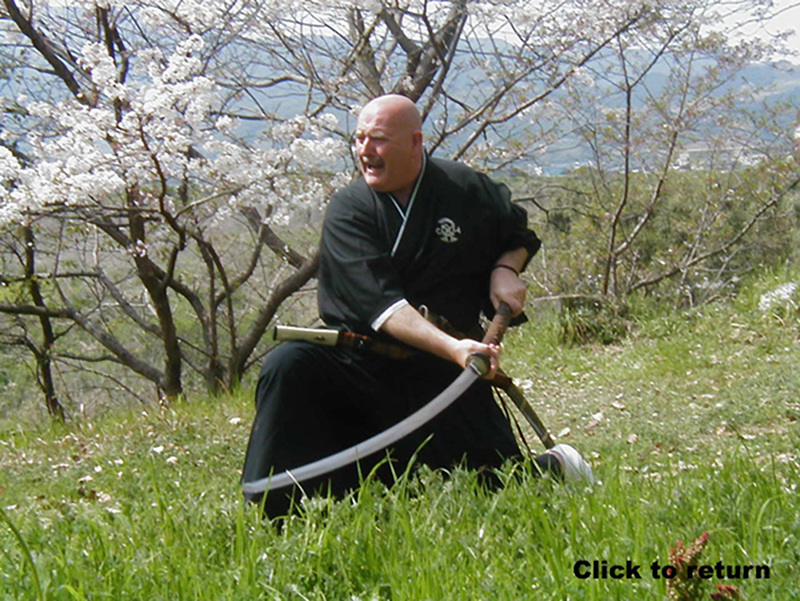 The ryu is listed of having Shihan as a teacher and leader. The word Soke adopted from Kabuki has never been used. Bugei Ryūha Jiten lists the following as previous Shihan including the founder. Needless to say the ryu is not hereditary either.